Assume you race against Usain Bolt in the 100 meter sprint. Not surprisingly, Bolt wins the race, and the margin of victory is 10 meters (although if he did race against me, it would be much greater!) He runs a 9.58, and you run 10.58. Intuitively, you would probably think that in both of the cases above, you would both cross the finishing line at the same time. It turns out that things are not quite as they seem. In order to simplify matters, let us assume that Bolt completed the race in his world record time, i.e. 9.58 seconds. So in the initial race, when he crossed the finishing line, you would be left 10 meters behind, having covered just 90 meters. In other words, it takes you 9.58 seconds to cover 90 meters. The last 10m in covered in 1.00 seconds. Now let us look at the first rematch case. In 9.58 seconds, Usain Bolt will have covered 100 meters and will just be crossing the finishing line. 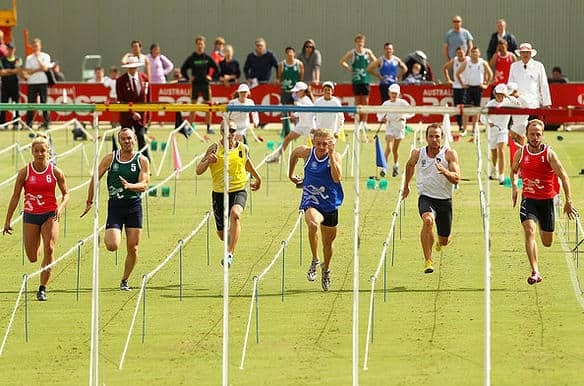 In the same time, you will have covered 90 meters, but as you started off 10 meters ahead of the starting line, you are also just crossing the finishing line. So for the first case, as expected, nobody wins. In the second case, after 9.58 seconds you will have progressed 90 meters from the starting line. Usain Bolt, on the other hand, will have covered 100 meters and having started from 10 meters behind the starting line will be at the same point as you. So after 9.58 seconds, both you and Usain Bolt are positioned 90 meters from the starting line. Unfortunately for you, however, the race has not finished yet as there are still 10 meters remaining! Since Usain Bolt is a faster runner, he will complete the remaining 10 meters in a faster time than you, so he wins the race! It may be counterintuitive, but the two cases produce a different result. The set up just described previously is obviously completely imaginary. This whole exercise, however, provides us with the opportunity to ponder a little on a more realistic situation, i.e. those races that athletes are handicapped according to their form. In some cases, for example, a 10 meter head start is offered for each second of difference in time. So if you were competing against Usain Bolt and you had been timed to run the 100 meters in 10.58 seconds, you would be given a 10 meter head start. There are a few potential pitfalls here. First of all, for this method to work even approximately, it has to be assumed that every athlete has been running to his or her full ability prior to the main event. If this is not the case, then an overgenerous handicap will be offered placing him or her in an advantageous position. 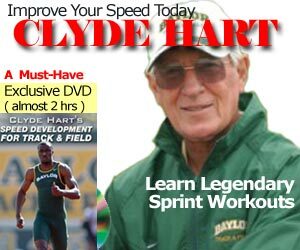 Athletes do not run at a constant speed, as there are an accelerating and a decelerating phase at the start and the end of the sprint. A time difference of 1 second will usually not correlate to EXACTLY 10 meters of difference in the distance covered, thus corresponding handicaps offered will not be entirely fair. 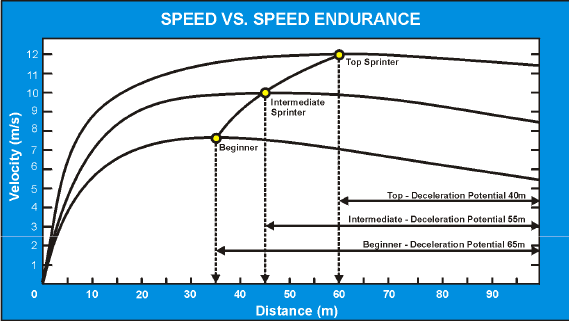 The chart below shows every sprinter’s last 10 meter speed (and time) is different, depending on their ability. Based on velocity, the last 10 meter split ranges from Usain Bolt’s 0.83 sec to a split of 1.00 sec for a 10.60 sprinter, and finally a split of 1.15 sec for an 11.50 sprinter! On the other hand, of course, they are many that believe that with all its shortfalls, the handicap system still makes a race much more interesting. The first to cross the line is the true “winner”. Nothing in sports, or even in life, is entirely fair. Whatever you may think, one thing is certain. If you do ever get to race Usain Bolt and get offered a handicap, make sure that you choose the shorter distance to run and give him the longer one!